ANOKA, Minnesota - On Target magazine recently recognized Federal Premium Hydra-Shok Deep with an Editors’ Choice Award for best-of-the-best in ammunition, as part of the magazine’s 17th annual awards program. 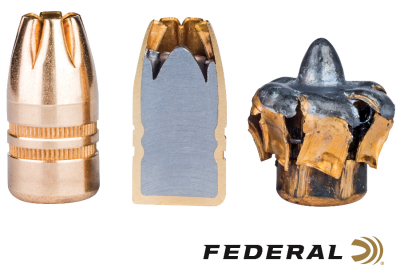 The redesigned bullet delivers improved penetration to optimal depths and significantly higher FBI protocol scores—both helped the new self-defense ammunition earn the title. The design changes in Hydra-Shok Deep better meet modern performance measurements. The bullets feature a more robust center post and a core design that penetrates to critical depths through common self-defense barriers, without over-penetrating. On Target is one of the leading publications in the shooting sports industry. Its staff tests and reviews guns, ammunition and hunting products, and presents the results in a straightforward, no-nonsense format that provides all the information consumers need to make purchase decisions. The print version of On Target can be picked up free at any of the nearly 2,000 firearm and hunting product retailers nationwide that distribute the magazine. The On Target Editors’ Choice Awards are reserved for the best of the best new products—those which demonstrate outstanding technical achievement or represent an extraordinary value for the money. Hydra-Shok Deep was initially launched in 9mm Luger 135-grain. Recently, it has also been released in 40 S&W 165-grain and 45 Auto 210-grain, in 20-count packs.